We’re turning our sites to summer here on the Maine coast. 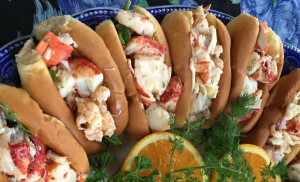 June is just around the corner and the annual Kennebunkport Food Festival will be coming soon. If you’ve never attended the Festival, we would love to encourage you to come up and join us. There’s so many great things to see and do before the really busy summer crowds descend on our little seaside village. Running from June 6 – 11th, 2106 this is a special celebration of the best chefs and restaurants in the Kennebunks and surrounding areas. Events on the schedule range from Cocktail parties at local venues to “Art of Dining” dinners at Kennebunkport residences with meals prepared by some of Maine’s greatest chefs. Most of the events require that you purchase tickets ahead of time. The Art of Dining dinners are hosted at local residences with food prepared by notable chefs with a different focus on types of food served at each. This year features chefs Rocky Hunter of David’s Opus 10 (Portland) and Chef Shannon Bard of Zapoteca (also Portland), among others. It’s a personal and intimate dining experience in a beautiful private home setting. Tickets are $195 per person and do sell out quickly so book those early if you want to participate. The festival schedule this year has a number of Cocktail Parties to choose from with an eclectic choice of restaurants. Choose from One Dock, The Colony or The White Barn Inn. Tickets are $45 per person. Federal Jacks and Pedro’s are throwing complimentary After Parties on the Thursday and Friday nights. While there’s no charge for a ticket, you still want to go online to get yours to avoid missing out on the evening. Signature events for this festival include the “Spirit of Maine” celebration on Thursday, June 9th, 2016 under the big top. This riverside celebration in Kennebunk Lower Village kicks off the festival in grand style. Many of our local top chefs will be preparing food and cocktails that showcase our local Maine produce. Food will be complimented with a selection of local craft beers, wines and cocktails. With dancing and a DJ, this is a great evening under the early Summer Maine sky. Tickets cost $125 per person and should be purchased online before the night. Another signature event back this year is the popular “Brews and Tunes” on the Kennebunkport Village Green. This event runs from 1:00pm on Saturday, June 11th with music starting at 2:00pm. Tickets are $15 if you purchase in advance, $20 at the door. The afternoon will feature music from Portland’s Fogcutters Big Band. There will be food trucks and, of course, brews! Plan to bring your own chairs and umbrellas for convenience. Outside food is not permitted on the Green during this event. Of course, one of the biggest new draws for the festival is the Historic Inns of Kennebunkport Garden Parties. They’re back again on Saturday, June 11th. This is an exclusive complimentary event for guests of the five Inns only. We invite you to experience a Taste of Maine and enjoy a peaceful interlude in our beautiful gardens. And YES, the 1802 House is featuring our signature 1802 House Mini-Lobster Roll again this year. Chefs from the other inns will offer Maine wine’s, cheeses, beers and whoopie pies. Please call us for more information (207) 967-5632. It’s a busy weekend and we fill up quick so make your reservation early! We hope to see you soon.